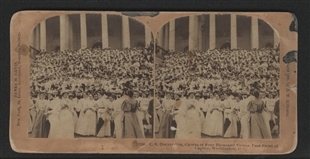 The chorus pictured here performed as part of the nondenominational “Christian Endeavor” convention that met in Washington in 1896. The gathering took place primarily on the White Lot, the area now known as the National Mall, between the Capitol grounds and the Washington Monument. This image was part of the growing trend among stereoview producers of publishing images of newsworthy events in the later 19th century.